Just returned from San Francisco's celebration of the 50th anniversary of Maurice Sendak's Where the Wild Things Are. Sendak is one of my heroes—but for reasons most people don't know. Several critics have pitted my books against Sendak's, nostalgic for his imaginative narratives and grumbling that my veg books are an affront on childhood innocence (Woohoo! I got mentioned in the same article as Sendak!). These naughty journalists didn't do their homework! Sendak was complex, wrote dark tales, and had an outlook about children more in line with mine than not. In 1963, Wild Things was banned by some librarians for being too dark and disturbing...sound familiar? "I don't believe in 'children.' I don't believe in 'childhood.' I don't believe that there's a demarcation. 'Oh, you mustn't tell them that. You mustn't tell them that.' You tell them anything you want. Just tell them if it's true. If it's true, you tell them." Keep this tidbit in your mental arsenal. There is NO universally accepted concept of childhood. Kids can handle the truth, they learn what we're brave enough to teach them. Is your kidlet the only vegan in his or her class? Could the teacher use a reminder? 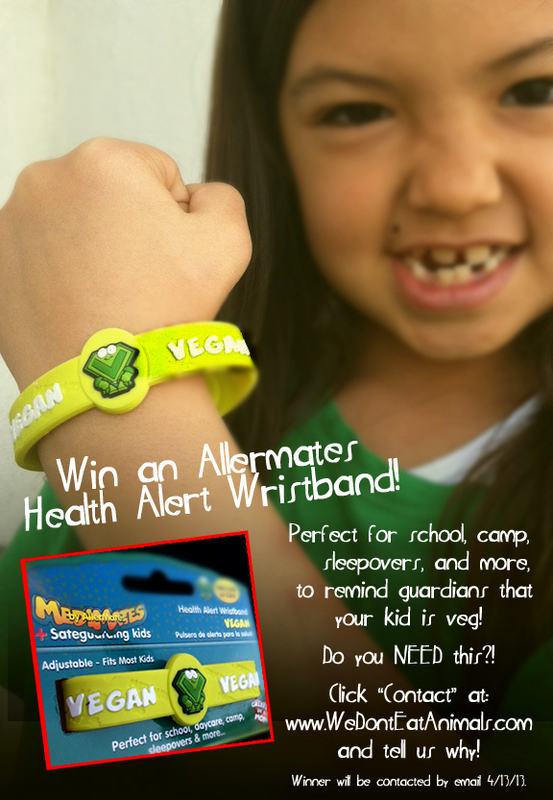 These "V-Man" wristbands by Allermates, (originally designed for kids with allergies) can help day guardians remember that your little one doesn't eat meat or dairy! Contest now closed. Thank you!